Kerri G. asks: Is it true that Rick Astley only made like $10 from Rickrolling? To begin with, for anyone who’s somehow managed to avoid the more than a decade old phenomenon of Rickrolling, in a nutshell this involves tricking someone into clicking on a link that takes them to the video for the relentlessly upbeat and infinitely cheesy 1980s anthem, usually by suggesting it’s a link to something else which is a particularly compelling click. So how did the curious meme of Rickrolling get its start? For that, it’s necessary to start with its much lesser known predecessor- duckrolling. Duckrolling got its start indirectly thanks to the founder of the occasionally infamous internet message board 4chan, Christopher Poole- better known online by his moniker “moot”. Not long before Rickrolling became the internet’s go-to prank, moot decided to make it so that anytime a user wrote the word “egg” on the site, it would autocorrect to “duck”. The prank was a big hit with 4chan users who were particularly amused that the word eggroll would automatically be stylised as duckroll whenever it was typed. As the joke evolved, some time in late 2006 one anonymous user Photoshopped and linked to an image of a duck with wheels- a literal interpretation of the word duckroll. It soon became a common prank on the site to to trick fellow users into clicking links that led to the image of the duck, resulting in the coining of the term “duckrolled” to describe the act of being duped in this way. This all brings us to Rickrolling. Some time in May of 2007 an unknown user on 4chan’s /v/ video game board posted a link purported to be for the trailer for the game Grand Theft Auto IV, but in reality took people to a freebooted upload of the music video for Never Gonna Give You Up. Google caches and a bit of trolling through the Wayback Machine reveals that this video, along with being the first known video created expressly to Rickroll internet denizens, is one of the earliest known examples of that music video being uploaded to YouTube. It’s also worthy of note that the uploading of this video predates an authorized upload by some two years. In any event, when linking Astley’s hit song became the new en vogue prank, the term Rickrolling, borrowing from Astley’s first name and the aforementioned duckrolling meme, was coined to describe it. As to Astley, he first learned about Rickrolling via friends of his Rickrolling him. Not getting why his friends were emailing him links purported to be to other things, but taking him to his hit song’s music video, he would later reveal in an interview that his teenage daughter let him in on the prank that was sweeping the internet. Which brings us to what the notoriously reclusive Astley thinks of his most popular song being, to put it bluntly, the punchline to a bad joke. After all, this once again thrust him in the spotlight he so rapidly exited in his late 20s when he got sick of the life of a popstar and decided he’d rather devote himself to other things, most notably raising his new daughter, Emilie, rather than being absent from her life for large stretches of time while on the road. I don’t see it as negative. If someone had messed around with it and cut it all up and made me look stupid – I mean I look pretty stupid anyway in that video – if it was nasty, then I’d be probably a bit pissed off, but it’s not. It’s like, “We’re choosing that video because it’s a full-on Eighties, cheesy video.” There’s no getting away from it now and I’ve got to own it because if I don’t, it’s like being petty. I suppose at first I was a little embarrassed by it. I always liken it to when people look through their photo albums or home videos from 20 years ago and think, Gosh, did I really wear that? The difference is, thankfully on the one hand and perhaps a bit scarily on the other, mine are out there for the public to see whenever they want. I find some Rickrolls really funny. Have you seen the one with President Barack Obama? 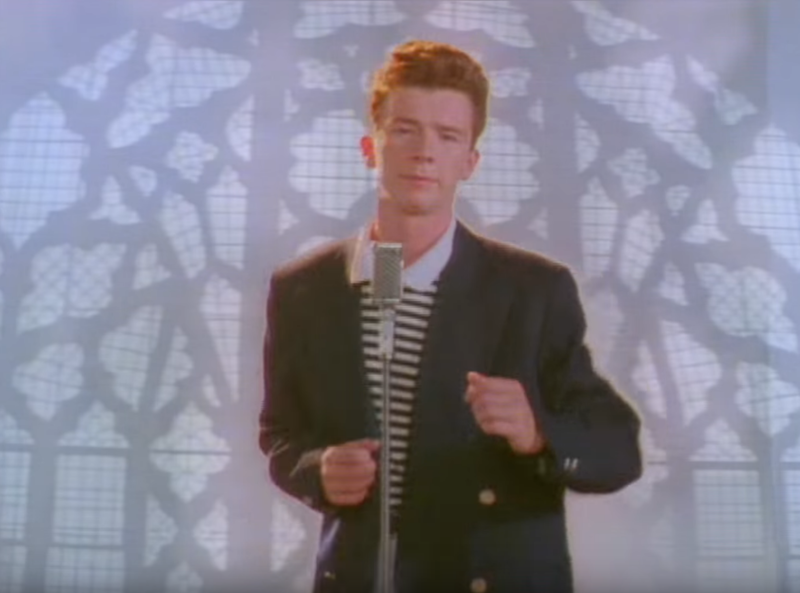 Someone has cut up his speeches and put them together so that he sings “Never Gonna Give You Up.” It’s totally amazing. I find it bonkers, by the way! That’s not to say he didn’t profit from Rickrolling. While you’ll often read on many an interesting “fact” website more concerned with clicks than getting information correct that Astley only made $12 thanks to the meme, this isn’t exactly accurate. While Astley has alluded to making very little off of his side of the YouTube revenue generated from the music video, with to date the authorized video on YouTube having almost a half a billion views, he does explicitly state he’s greatly profited from the fad, including seeing a significant boost in sales of his records following the phenomenon of Rickrolling. Further, his first solo album following the Rickrolling meme, 50, released in 2016, was also by far his most successful album since his glory days a couple decades before, managing to debut at #1 on the UK Albums Chart and ultimately going Platinum, despite his original expectations that nobody would even notice he’d released an album at all. More directly in 2009, while he was actively staying out of the spotlight during most of the Rickrolling meme’s peak popularity, he did make one exception- Astley himself performed the world’s first live Rickroll at the annual Macy’s Thanksgiving Parade, with the opening salvo of Never Gonna Give You Up abruptly interrupting another song as Astley waltzed around lip syncing the lyrics. I don’t feel famous any more. To some degree I am – when I’m on stage in front of thousands of people singing Never Gonna Give You Up – but in my day-to-day life, no one really cares. I don’t get recognised until I’m on stage and then I can walk off and forget about it. It’s great. Ego dictates it would be nice to play Wembley Arena on my own but it’s a fair trade, being able to do what I do and also lead a quiet life. That dude sounds like someone to hang with — very humble, very grounded and a sense of humor. Yep, there were a lot of interviews we read while researching this and he genuinely seems like a really cool, centered, and humble guy. What a gracious guy. I enjoy “Never gonna give you up”. The lyrics are sweet and innocent. He has a great voice. The dancing is fun. I love the bartender dancing and the backflip off the wall – really cool!!! I have literally spent the last 10 years never having been “Rickrolled”, or seen any examples of someone being “Rickrolled”, and deliberately not once doing a search to find out exactly what “Rickrolling” meant. Finally, someone posted an article which came right out in the title with the promise of explaining “Rickrolling”. I fully expected the link to be a rickroll. Glad it wasn’t, it was a nice history lesson. Of all the a$$hole celebrities one reads about every day- falling all over themselves to stay in front of the camera, to stay “relevant,” to convince you that they know more than us little people – Astley is a man to be emulated. His humility and grace are an inspiration. My best wishes for him and his family.